Reader Question: Human Powered Digging Machines? Some of the products Gaute ran across include the krafse (a sort of narrow shovel of Norwiegan descent, known for its ability to just skim the soil and pick up/move above-ground material) and the Wovel, which Toolmongers have weighed in on previously. Gaute wrote that he tried an improvised version of the Fresno scraper (pictured above) designed to be moved by two people and achieved some success in moving aggregate. 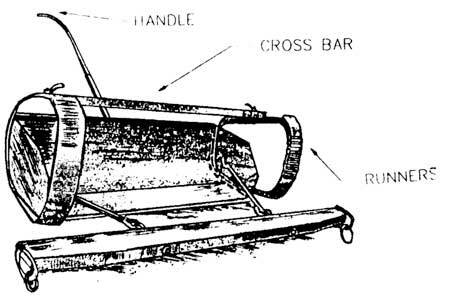 12 Responses to Reader Question: Human Powered Digging Machines? The best solution? Hire some laborers. So Jim, you used the snow blower as a hand held dozer. Nice work, I may have to use that someday. Better yet if I wind up with a lot of work like that actually put a blade on an old snowblower. Not a digging tool, but material moving tool. Use a square shovel for aggregate. What got left out about the “krafse” is that it goes together with a tray, a “brett”. You do have to bend down to pick it up and dump the contents in your wheelbarrow, but it’s still much better than just a shovel. The curvature on the krafse blade makes it strong but light, and depending on the angle you hold it, you can get a concave, convex, or straight cut, and you can use it sideways as a “pick-light” to break up packed dirt. Apparently its a hit with archaeologists worldwide. There’s some more info here. Lots that I as a Norwegian had no idea about. Those “Yooper Scoops” are pretty much standard issue here in Norway. They depend on sliding on the snow. On dirt they would be unusable. On that page there is one with wheels as well, but its to wide to get around in our garden. What I did was to attach a rope to both sides of a snow “shovel” like this. With one guy pulling and one guy pushing and steering like a scraper, that was very efficient. On the same order as the snowblower-dozer hack I imagine, just more work. Perfect for double digging garden beds I imagine. The link for the Fresno scraper is bad BTW. 2 Gaute, thanks for the term – “double digging”. Did not know that 🙂 Yes it is of more use for cultivating than for digging trenches. I think – the main improvement of spade/showel is using more ergonomic handle, than just straight stick. So far was wheelbarrows go, put a 2nd wheel up front. Believe me after you’ve tried it with a load on a hill or grade you’ll never go back to one wheel. Gaute, I’m not surprised that you’re familiar with the Yooper Scoop. That region of Michigan is inhabited by Finns, Swedes, and Norwegians. Thanks for all the other information.